A number of websites and platforms provide real-time charting capabilities for 1-minute, 5-minute, and other intraday charting time frames, and some of them do so for free. That could be a great deal, depending on your goals. Following are five favorites with No. 1—in many traders' opinions—being the best. You might want to keep a few considerations in mind, however, before you jump in. Free is nice, but although the data might be real-time, it's not "official." Free real-time data usually comes from just one data provider, which means you might not see all the price movements occurring in the stock or exchange-traded fund (ETF) that you're day trading. You'll have to pay if you want to receive all official price data from a market. That said, free real-time day trading charts are an excellent backup data source on the off-chance you lose quotes from your broker. They're a great training tool for new traders who are looking to study day trading and create strategies based on how prices move in real time. Free stock market data is provided by BATS, an electronic exchange that processes trades on U.S. stocks then publishes those transactions in real time. Websites and charting platforms use that data to provide real-time charts to their users. These free real-time charts only show the stock transactions that occur through the BATS exchange. The charts don't show the transactions that occur through all the other electronic exchanges that compose the U.S. markets. BATS data represents an approximation of what's happening in real time. You'll see some of the price movements and transactions, but not all. Volume data is approximated as well because the stock charts only track volume that's processed by BATS, so you're not getting an accurate picture of a stock's total trading volume. When you pay for official real-time stock market data and charts, you receive the combined price and volume information for all the electronic exchanges that compose the U.S. stock markets, such as the New York Stock Exchange and NASDAQ. The BATS exchange is frequently used in actively traded stocks so a transaction will likely go through on BATS at each price level to which the stock moves. The charts turn out to be quite accurate in this respect. In lower volume stocks where fewer transactions occur, a transaction might not go through on BATS at each price level where a transaction on another electronic exchange takes place. In this case, you're missing pieces of information on your free charts that paid real-time charts would show. Paid real-time official quotes provide historical time and sales data— Level I data and possibly Level II data—showing how many shares are being bid and offered at various price levels. BATS provides its Level and time and sales data on its website, but this data only reflects transactions taking place on BATS, not other electronic exchanges. Finally, real-time data from free sites isn't guaranteed to be accurate or timely. When you pay for real-time official quotes, you have some recourse if the data feed is unreliable or inaccurate. With a free site, you have to take the data as is. That said, here are a few free charting platforms you might want to explore. 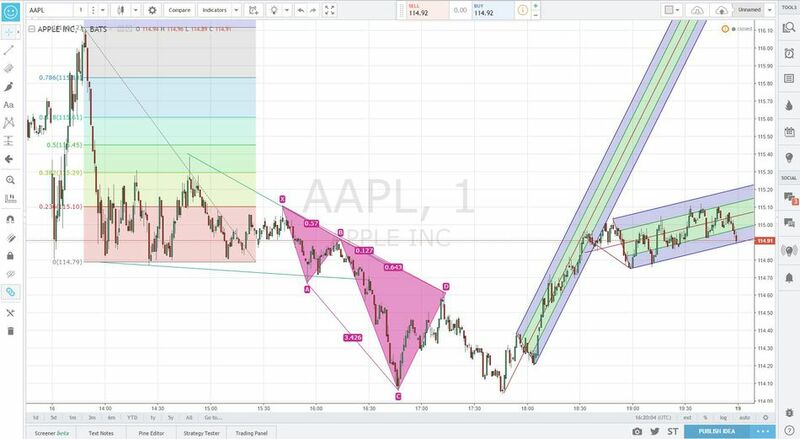 TradingView provides real-time stock charts for day traders on 1-, 3-, 5-, and 15-minute time frames. The charts are visually appealing and they provide hundreds of technical indicators. TradingView is also a social media site. Traders can easily share their charts and ideas with each other. They can follow other traders and discuss stocks and other markets. Just beware of who you're watching because not everyone sharing charts and ideas is a profitable trader. Traders can create watchlists and alerts, see which stocks are hot, and even trade directly from TradingView charts by connecting with a broker. Different chart layouts can be saved and loaded, and the stock of one chart can be compared to other stock charts on the same screen. A strategy tester and stock screener round out the tools available to TradingView users. Be sure to check out the "magnet mode" when you're creating charts or drawing lines. Stocks aren't the only data you can chart on TradingView. Futures, Forex, bitcoin, contracts for difference (CFDs), indexes, economic data and global data are also available, although futures are delayed. Quotes for many global stock exchanges are also provided. The site is free with upgrade options that provide additional features and official real-time data for stocks and futures markets around the globe. Ads constantly pop up on the free version of the site, but they're a minor hindrance when you're performing analyses. TradingView offers the most extensive list of markets, indexes, and economic data. You won't have to switch charting platforms to view charts from other markets. It's also the most integrated socially. Maybe you want more than charting and tracking ability. Maybe you want news, too. BigCharts gives you that along with analysis and historical quotes. You can set your own unique time frames to build a "quick chart" or opt for a more advanced chart with additional features. Data is available for advanced charts in 1-, 5-, 15-, and 60-minute time periods and goes back as far as 1976. BigCharts includes a library of over 30 technical indicators, but, alas, they're not modifiable. You also get to choose from seven different chart options. BigCharts will email your custom charts to you daily or weekly—it's your choice. Many traders particularly like the news feature and the 12 scans to keep up to the minute with what's going on. The scans pinpoint stocks that have experienced large shifts in volume and price, waving a flag when that happens. BigCharts will also let you know when any have reached yearly highs or lows. Technician is a free charting platform that provides real-time intraday charts for U.S. equity markets as well as delayed data from many global stock exchanges. Forex charts are real-time. Futures and index data are also provided, but they're delayed. Intraday charts are available on 1-, 3-, 5-, 10-, and 15-minute time frames. Drawing tools, chart types, and technical indicators are available. Traders can easily share charts and discuss stocks through a StockTwits feature, and they can save different chart layouts. Technician is free to use upon signup. Trading is available through Technician charts, assuming a brokerage account is opened with a partnering broker. Add-ons are available through the Technician Marketplace for a monthly subscription fee. The free version is usually clear of ads, allowing you to analyze your charts uninterrupted. Although the lack of ads is a huge bonus, Technician lacks some of the technical analysis functionality offered by other platforms. However, Technician promises that a new and improved version is in the works. Technician users gain access to real-time charts when they connect to a live brokerage account to Technician. FreeStockCharts was one of the first websites to offer charts that were functional, attractive, and easy to navigate. Day traders can monitor stock prices on 1-, 2-, 3-, 5-, 10-, and 15-minute time frames. There are technical indicators and drawing tools, as well as a stock comparison feature. Save portfolios, scan for stocks, and create various chart layouts. Create alerts or trade reminders, and easily share your charts on Twitter or Facebook. Real-time index and Forex data are also provided, as well as delayed data for Canadian stocks. Ads are a constant feature, however. They don't interfere with analysis, but they do reduce the size of the chart area on your screen. In terms of technical tools, FreeStockCharts falls somewhat in the middle. On the plus side, it's very user-friendly, at least if you're not looking for fancy, rare or elusive indicators. Unfortunately, FreeStockCharts only runs on Internet Explorer and Safari for Mac. Paid plans for FreeStockCharts start at $19.99 a month. StockCharts' free capabilities are pretty robust, however. You can do bar, line, or candlestick charting with more than 40 line studies and technical indicators, although the free version only lets you plot three indicators at once. The indicators are modifiable. Data is displayed on either a weekly or daily basis, but you can only go back three years for data unless you pay up. Another downside to StockCharts is that you can't save your screens, even if you splurge on the Basic subscription. In addition, the Basic screen is a little on the drab side, so you can imagine how plain the free screening module is. An extra subscription is available as well for $24.95 a month with a somewhat more advanced user interface. It also allows you to create custom scans, which is a nice touch...but not for free.